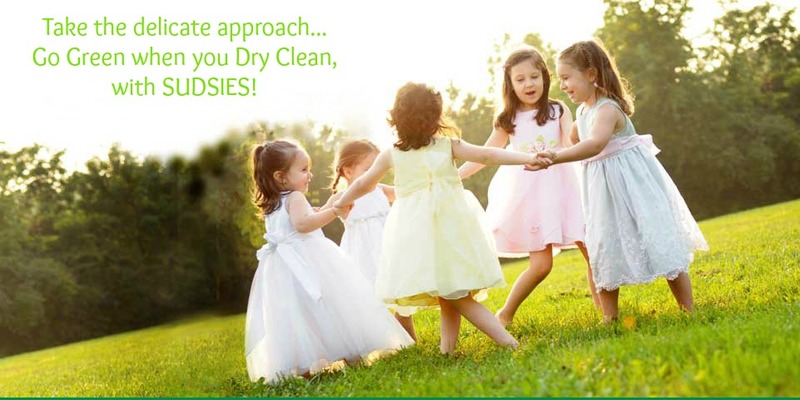 Clothing at Sudsies Dry Cleaners & Laundry will take on an even greener tone. The South Florida-based dry cleaner announced the expansion of its environmentally-friendly cleaning department with the most recent high-performance equipment and agents. These processes mainly incorporate Professional Wet Cleaning and Hydrocarbon Cleaning, cited by the Toxic Use Reduction Institute (TURI) in Massachusetts as among the top alternatives to traditional perc dry cleaning systems that better support environmental and consumer health. Professional Wet Cleaning is an alternative process incorporating biodegradable detergents, texture enhancers and specialized finishing equipment. According the recent TURI report, the method does not emit hazardous air pollutants and requires the lowest electricity usage of all garment cleaning options. Additional key environmental organizations including Natural Resources Defense Council (NRDC), Green Peace, and Sierra Club Green Home deem wet cleaning as the most eco-friendly solution. While the technology isn’t the newest of the perc dry cleaning alternatives and has its limitations, it has evolved with significant improvements to its effectiveness and safety. New cleaning solutions and computer controlled conditions are gentler on fabrics, helping to maintain the integrity of the garment and a new-like appearance. Despite wet cleaning benefits, there is still no single cleaning process that is perfect for all types of clothing. To best provide high-quality effectiveness across the vast range of its in-bound clothing, Sudsies has also incorporated Hydrocarbon Cleaning to its arsenal of green alternatives. This second innovation does not rely on any Environmental Protection Agency (EPA)-classified hazardous air pollutants to function and is recommended by the agency’s Design for Environment Program. Sudsies’ hydrocarbon technology is especially suited for fragile articles, vintage wears, and intricate couture pieces, all of which are core specialities for the company. Eco-friendly initiatives are part of Sudsies’ care trifecta for its clients, clothes and environment. The dry cleaner’s full-service offerings include dry and wet cleaning, laundry, alterations, restoration services, vintage and couture care, bridal gown preservation and on-site home cleaning. Customer convenience is further enhanced with complimentary personal pick-up and delivery to all locations across Miami-Dade and Broward counties, as well as nationally via a Sudsies Express Mail service that cleans and ships garments across the United States. More information about Sudsies and its offerings can be found at www.sudsies.com or by phoning 1.888.898.SUDS (7837). This entry was posted on September 5, 2013 at 7:30 am, and is filed under Sudsies Blog. Follow any responses to this post through RSS 2.0. Both comments and pings are currently closed.